Berlin, March 2 (IANS) VfL Wolfsburg came back thrice to beat SV Werder Bremen in a 5-3 goal festival while Borussia Monchengladbach cruised to a 2-0 victory over newly promoted SC Paderborn 07 to close the 23rd round of the Bundesliga. Bremen on Sunday suffered their first loss in 2015 as Wolfsburg fought back three times to extend their unbeaten run to 11 games, which is a new club record for the "Wolves". Wolfsburg's in-form striker Bas Dost had a large role in the 5-3 victory, as he scored a brace to extend his goal account to 12 goals in 13 matches, reports Xinhua. Bremen needed only nine minutes to get into gear as Wolfsburg failed to clear the ball from the danger zone allowing Zlatko Junuzovic to break the deadlock. Wolfsburg immediately responded as Daniel Caligiuri made use of goalkeeper Raphael Wolf's fisted clearance to level the scores one minute later. Bremen remained unimpressed and continued their offensive run as Franco di Santo tapped in Levin Oeztunali's cross into the box. He gave the hosts the 2-1 lead at the 16th minute. It was a short-lived joy for the hosts as the "Wolves" restored parity again only two minutes later. Maximilian Arnold headed home the two-all-draw following a cross by Kevin De Bruyne. However, Bremen grabbed the lead for the third time in the 28th minute when Wolfsburg's Vieirinha deflected Felix Kroos long-range effort from 18 meters into his own goal. Bremen took the 3-2 lead into the interval before Bas Dost donated a brace within three minutes at the second half, giving his side the lead for the first time in the 51st minute. The "Wolves" utilised their momentum to make the game safe as Caligiuri sewed up his double strike two minutes later to round off the 5-3 win. With the 15th victory of the season, second placed Wolfsburg remained in the hunt of front-runners Bayern Munich, who have an eight-point advantage atop the standings. 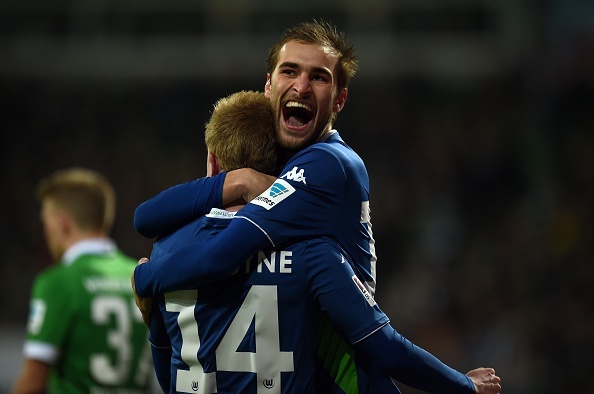 Meanwhile, Bremen slipped to the ninth place suffering their ninth loss of the season. Elsewhere, third-placed Monchengladbach underlined their UEFA Champions League ambitions as they cruised to an uncontested 2-0 victory over newly promoted Paderborn. Fabian Johnson opened the scoring for the "Foals" early in the first half before Patrick Herrmann put the game beyond doubt with the 2-0 lead in the closing period. Monchengladbach tightened their third place in the standings with a four-point gap to chasers meanwhile newly promoted Paderborn slumped into a relegation play-off spot.